I suppose, in the end, it was partially my own fault that he wasn’t healing his pet. 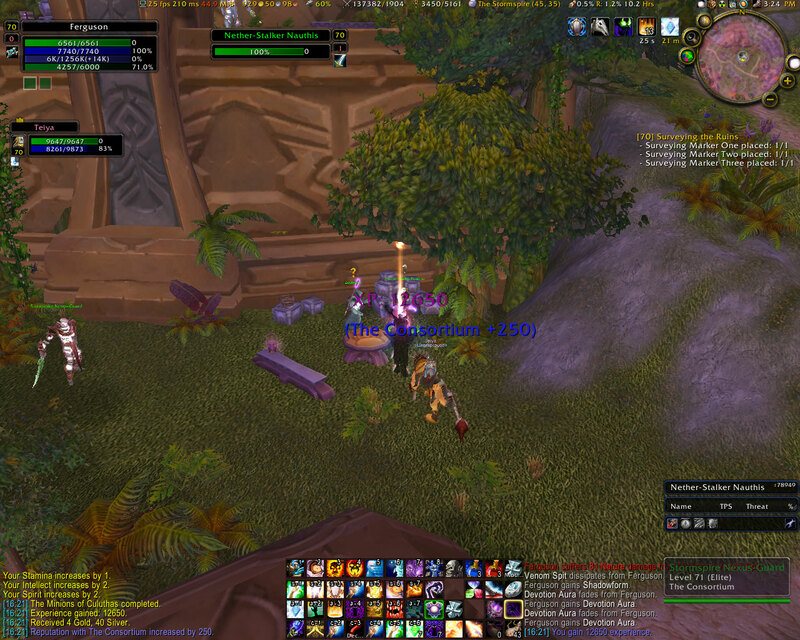 The group was doing well otherwise, and I’d been pretty good about keeping his pet healed up. Maybe he didn’t realize that during a boss fight, I simply can’t focus on it. This got me thinking – are there other hunters out there that rely too much on their healers? What about healers who refuse to pay any attention to pets? What if the two were to collide?! … Anyway, I’d like to discuss this issue that affects me doubly – under what circumstances should healers heal hunter pets? I decided that I need to get some input on this issue, since if I’ve learned one thing through PUG-ing, it’s that everyone has different strategies and expectations when it comes to healing. A Hunter should be responsible for their pet. A Healer should not be completely ignorant of pets. From a Healer standpoint, pets take the lowest priority. It is irresponsible of a healer to let a player die while they are trying to save a pet. However, in my opinion, it is against the principle of being a healer if pets are completely ignored. Even if it means watching them die as you wait for a chance to toss a Renew on them, it’s imperative that you at least know what is going on and keep them in the back of your mind. Hunters should understand if you don’t get to heal their pets, but on the other hand – if you are sitting around twiddling your thumbs while the pet is at low health, show the pet some lovin’. Lassirra of The Hunter’s Mark discovered the same thing as me while leveling up a priest after a hunter: there are more opportunities for this than I had thought there were. Ego from the Egotistical Priest, told me about how she has a separate group in her raid UI (using XPerl) for pets. It is less prominent than the regular raid groups, but when she has a couple seconds of free time and mana, she can quickly have a look and give a hunter a hand. As for hunters, pet management is key here. Proper pet management means knowing when to toss a mend pet, and when to recall your pet to your side. It also means not really having to worry about the issue of getting heals from the healer! If you are keeping good control of him, your pet should not need heals! Unfortunately, especially when still leveling, some hunter’s haven’t really taken the time to learn how much is too much for their pet, Bremere of Healing Anonymous has had similar problems with hunters in lower level instances. But there are situations, like when a pet is off- or even main-tanking. At that point, Mend Pet shows itself for what it truly is, an ersatz Renew. You wouldn’t expect a tank to survive on just Renew, especially if it’s a cute little kitty-cat? This is one of those times when the healer priority list needs to be fumbled up. Yet still, some healers somehow forget to help a hunter out even in this situation, much to Pike’s frustration (Apect of the Hare). Matticus of World of Matticus brought up an excellent point about PvP. Since obviously, I’m not a big participant in the arenas, I really hadn’t thought about the value of a pet in that situation. Those things can be deadly to a caster – and if you can keep them up a little longer, it’ll probably do you some good. In the end, it depends on a number of factors like group composition, amount of group damage taken, spare time and spare mana. Hunters should do what they can to take care of their pets – but when its appropriate, heals are always welcome! Thanks to all those who gave me input to help me write this post! You master the art of Beast training, teaching you the ability to tame exotic pets and increasing your total amount of Pet Skill Points by 5. Exotic, you say? Oooo! How intriguing. Even more intriguing is how little we (and the developers themselves) know about what exactly this could mean. My first reaction was non-combat pet training! Wouldn’t it be cool to see that little bunny hopping along the road, and instead of giving it the standard drive-by axe-murdering, you could tame it and keep it in your pocket! Cute! But then I thought, well, as cool as that would be, I don’t think it’s a talent-point worthy cause. /sadface. Well, if you haven’t heard the news, Exotic pets seem to be more along the lines of Devilsaurs and the other beast-like creatures that have been previously untamable. Okay, this will be a bit of a rant – and I know many people out there are going to disagree with me wholeheartedly… but what is the point of having a blog if you can’t be biased? Let me just start of by saying – I like do to PvP. I spent enough time in Alterac Valley to rep up to Exalted for my Wolf, and then did it AGAIN to get the Alterac Valley tokens when the untimely change came in the way the mount was purchased! I will do Arathi Basin with or without a pre-made any day of the week! Heck, I even leveled on a PvP realm! And then Arenas came into the picture. Okay, neat, they are like mini-battlegrounds, or group-sized duels, that could be fun, says I! I can see the appeal. And I wasn’t the only one that saw the appeal, the arenas quickly became very popular. In fact, they grew and grew to be more popular than battlegrounds had ever been. People focussing purely on Arenas, tournaments being held, paying money for good teams to gain you points… it was becoming quite a big part of the game, bigger than I ever thought it would be. Again, what others do with their game time is their business. I don’t care if people are spending all their time in these arenas – although I’ve tried my hand at it and couldn’t really see the appeal in these < 5 minute matches, with no variety of scenery… Feels like ersatz Halo, really. I come to WoW for the epic battles, for seeing new places and working together with a group of people. Arenas would never be the focus of my game – just like PvE would never be the focus of others. Now let me get to the meat of the post – my whole point. My problem is that arenas seem to have become a focus for Blizzard. They appear to be paying more attention to the arena PvP crowd than the PvE crowd, which in the end, I believe to be the core of the game. They’ve begun balancing classes for PvP purposes, changing abilities to change how they affect arenas, and seem to not even care how this affects PvE. All I ever hear about is arenas nowadays. And I am sick of it! I listen to a number of WoW podcasts on my bike into/from work, and they seem to be flooded with content about arenas. One in particular I have noticed is the WoW Insider Show. The majority of the time, its arenas, arenas, arenas! Do they ever talk about how the Al’ar fight works, or about group composition for raids? Nope! It’s all “what do you think of this new change for arenas?” or “What do you think of the RMP arena team make-up?” Honestly, I don’t care about the arena tournament, I have only a passing interest in Season 4 gear. There is more to this game than that. The WoW universe seems to have become two completely different games smashed into one – the Arenas game, and the PvE game. To me, it feels awkward at best to have these two games clashing with each other. And unforunately to me, it appears the Arena game is winning out. Afterall, when was the last time someone offered a prizes of $200,000 for downing a raid boss? At 4:24 this afternoon, in the heart of Netherstorm… Fergy entered the wide world of LEVEL SEVENTYISM! It was a long couple of days, but I made it! And I’ve already managed to max out my tailoring, craft an entire Primal Mooncloth set and respec to holy! I am determined not to be a ersatz healer! BOOSTAH! For scaring me into finally getting my booty to 70! And also, for giving me a CRAPLOAD of Netherweave and Primals. If it weren’t for him, I’d probably still be level 66 hanging out somewhere between Terrokar and Nagrand. WoW Word of the Week! So now that I’ve started blogging, I’ve realized that my vocabulary is severely lacking. I have always managed to get my point across using just the words that are short enough to remember how to spell. And with a career as a software developer, the shorter the word – the better! Unfortunately, that’s just not the way of the blogging world. So the idea is, every Sunday I will post a word that I don’t know (generally chosen by me because I think it sounds funny or it has a Z in it or something) and I will attempt to use it in a WoW related sentence. But anyone who knows me, knows that is just not enough to get me to remember it – so my goal is to use this word ONCE in every post for the coming week! This is where you come in. Your goal is to give me more examples. When I post the word, please try to make your own WoW related sentence, see if you can help me get the idea! Your second job, and the one that will probably take the most work: Make sure I remember to use this word every post! If you catch me not using the WWotW, well, you win a prize. Example: “For the Alliance!” is such an ersatz battle cry.